Disposal - Northstar Pulp & Paper Company, Inc.
Northstar Disposal has specialized itself as a waste hauler catering to the needs of the industries of Western Massachusetts and Northern Connecticut. This service allows us to provide a “one-stop shop” to our commodity suppliers whereby Northstar is responsible for handling not only the scrap paper, plastic, foam, and metal – but also the rubbish that an organization produces. We believe that this holistic approach allows us to fully comprehend the byproducts of an organization and in turn provide detailed recommendations on measures to reduce their waste stream and increase their marketable recyclable products. This approach allows us to add value to our suppliers by reducing their rubbish hauling costs, increasing their recycling revenues, and improving their carbon footprint. Installation of appropriate weather-proof enclosures to ensure access to rubbish compactors in conditions year-round. This is done entirely by our team mechanics that done this hundreds of times throughout the northeast. Lease or sale of only the most durable, efficient, and practical disposal equipment. The standard compactor supplied is a Marathon RJ-225 HD Compactor, which Northstar is very familiar with and has spare parts on hand at all times. Well maintained roll-off fleet of five trucks that are equipped with state-of-the-art GPS tracking systems that allows us to efficiently dispatch our trucks and ensure prompt service. 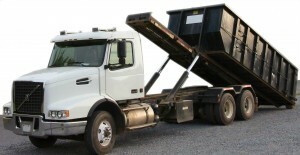 Book your rental dumpster online!